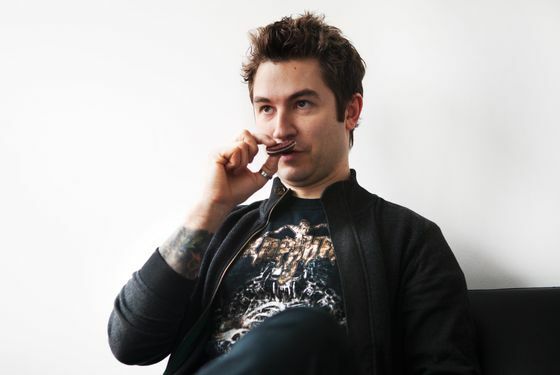 Alex Stupak: I thought they’d be redder. Stupak: Red velvet is less a flavor and more of a perception of flavor. If you look at the batter, it’s usually just a white cake with a tiny bit of cocoa powder in it. The red food-coloring is a deeper, bloodier red. Is cream-cheese frosting the standard for red velvet? Yee: For cakes, yes. I guess it brings out of the chocolate-ish flavor? Stupak: I used to do consultation work for a catering company. You know how when you open up a box of cake mix, it already smells like cake? But as a pastry chef, you bake cakes all day long, and they don’t smell or taste like that. These companies create cake flavoring, and I can tell there’s something like that in this. It’s a Platonic nexus of butter, eggs, and sugar. And it smells perfume-y. How does it compare to a regular Oreo? Yee: They’re a little less chocolaty. Stupak: That’s what I’m missing. Yee: You taste more of the cream in this one. David Yoo: It’s really sweet! Stupak: In an Oreo, when you look at the dough, it’s 90 percent cocoa powder. That’s why it’s so dark. So I think the greatness of the original Oreo is that contrast: You don’t realize how salty and bitter the cookie is unless you eat it on its own. It’s that against the super-sweet fondant. These are tasty, but I think some of that is lost. These are borderline sickly sweet. Yee: I think I just like the wafer! When I had them as a kid, I would just eat the wafer part — not the cream. I like the crunch factor. Stupak: I was the opposite. I used to throw away the tops of eight or nine of them and eat all the stuffing. Yoo: It’s definitely a lot sweeter, but I think with a glass of milk, it’d be perfect. You could make a badass cookies-and-cream milkshake. In general, do you like red-velvet desserts? Or it just a shtick? Yee: I’d rather use chocolate or vanilla. But we do get requests for red velvet desserts … We do a birthday-cake macaron. We actually purchase an extract. I always wonder what is actually in it! It tastes like butter aroma, sugar, and sprinkles. It’s our most popular flavor. Stupak: I think it not being fluorescent red was a huge miss. There’s something about foods that are red and pink that make them feel more like a treat. Maybe they were trying to make them look sophisticated! Which you should never do with red velvet. Have you ever played around with an Oreo dessert, Alex? 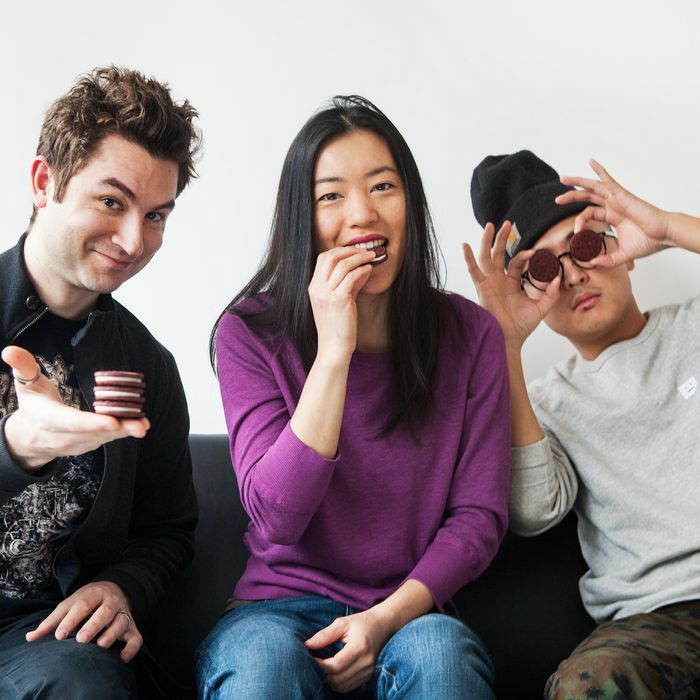 Stupak: At wd~50, once upon a time, we made our own Oreos. And we made the cream on the inside flavored like menthol because at wd~50, there has to be something jarringly challenging about it. But that kind of crumbly cookie on the outside, it’s a really jet-black dough that I’m into for crumbs. David, when working on your Cookies & Cream ice cream, did you think about making your own Oreos? Yoo: I tried it, but it’s a familiar taste that everyone grew up with — so it’s nostalgic for the customers. When they come in, we tell them there are Oreos in the ice cream, and they say, “Oh my God!” It’s weird because a lot of people appreciate that. It’s our best-selling flavor by far. Everyone loves Oreos. Would you use Red Velvet Oreos in an ice cream? Yoo: I’d definitely consider it. On its own, I think it’s a little heavy. But in an ice cream, it could be great. 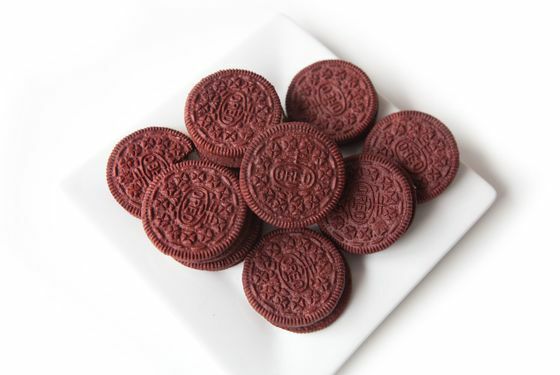 Okay, final answer: Would you buy Red Velvet Oreos? Stupak: I think it’s something that kids will really like. There’s something in that cream. 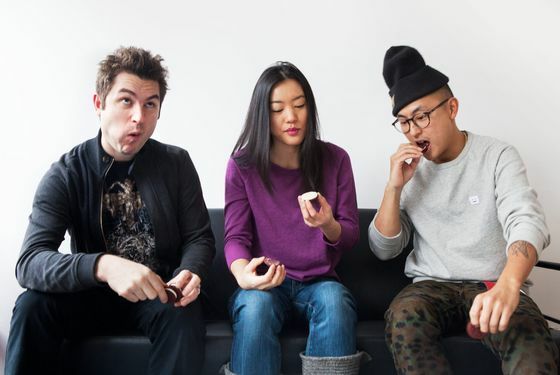 Yoo: It tastes like frosting with a side of cookies.